Personal trainer Tracey Kennedy might not have a Defence background, but she certainly knows how to bring her ‘troops’ into line at the break of dawn along Semaphore Beach several mornings a week. Tracey also a Director of SMART Fabrication at Port Adelaide alongside husband Simon has for the past two years been at the helm of a side-business, SMART Fitness. 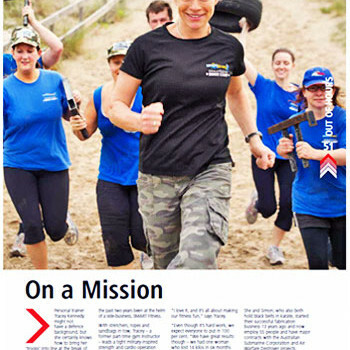 With stretchers, ropes and sandbags in tow, Tracey, a former part-time gym instructor, leads a tight military-inspired strength and cardio operation with around 30 participants (including defence industry colleagues and the DTC’s own Deputy CEO Kerryn Smith), all in the name of getting super fit. “I love it, and it’s all about making our fitness fun,” says Tracey. “Even though it’s hard work, we expect everyone to put in 100 percent. 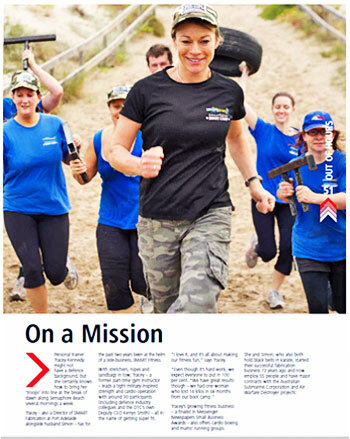 “We have great results though we had one woman who lost 14 kilos in six months from our boot camp.